LANSA Data Secure Direct was easy to implement using our own skills. High Liner Foods Inc., with its head office in Lunenburg, Nova Scotia, Canada, is one of North America's largest processors and marketers of prepared, value-added frozen seafood and pastas. High Liner markets its products under the High Liner, Fisher Boy and Gina Italian Village brands. High Liner uses LANSA low-code development across its Windows and IBM i server platforms, for web, rich-client, 1WorldSync and EDI-INT extensions to its ERP system. A LANSA-based Virtual Supply chain has helped High Liner to transform its business and emerge as an industry leader. Peter Burns, director of information services at High Liner, says, "Our virtual supply chain means that people have information much faster. Everybody in our supply chain has easy access the same up-to-date information. You are getting rid of paper, you are getting rid of errors, but most importantly, you are making information available to people right across the organization and to third parties. That is what a virtual supply chain is all about." Our virtual supply chain means everybody in our supply chain has easy access the same up-to-date information. Founded as a fishing company in 1899, High Liner lost 90 percent of its allowable quota when the North American east coast fishery collapsed in the nineties. "We couldn't go fishing anymore in the local seas," explains Burns. "We had to change our business process and decided to focus on value added food processing. We changed from being a fishing company to being a frozen food manufacturer and started sourcing raw materials from suppliers in China, Russia, South America and many other parts of the world." High Liner had just implemented JD Edwards World ERP system. This provided the functionality for production planning and raw material forecasting. But communicating requirements and shipping information with overseas suppliers was troublesome. Suppliers faxed information about the products they were shipping, which High Liner entered manually into the system. For each container huge reams of paper were involved, because quantity and quality information must be specified in detail. "While data entry errors were not so much of a problem, keeping up with the paper work was a challenge," says Burns. "Sometimes a fax arrived so late that a container would arrive at one of our distribution centers before we knew it was on its way. We wanted to be able to track containers more efficiently and to inform suppliers of our raw material requirements." High Liner's IT group, together with the newly formed procurement group, designed a virtual supply chain where preferred suppliers would be able to see material requirements directly from the ERP system and respond with firm shipments, including all the required quality information. The core ERP functionality was provided, but communicating with suppliers was troublesome. High Liner selected LANSA for the Web for the development of its Virtual Supply chain. "We have used LANSA for 14 years and without a complete re-skilling we were able to quickly build our first web process. It took one person two months to do the first build. Defining and re-engineering the business process took more time than the actual construction of the solution." High Liner uses JD Edwards World without any modifications. However all extensions are built with LANSA. High Liner's Virtual Supply chain is an add-on to JD Edwards Manufacturing and Purchasing, and the School Food Service extension is an add-on to JD Edwards Sales and Distribution. High Liner also uses LANSA to provide a browser extension to internal departments, for example to view Key Indicators in Manufacturing and incoming shipments in Material Planning. Defining the business process took more time than the actual construction of the solution. High Liner's virtual supply chain allows all members of the supply chain, including suppliers, shipping companies, customs brokers, quality control and manufacturing staff, to track orders, shipments and delivery dates in real-time from anywhere in the world. LANSA makes High Liner's forecasted raw material demand, produced by JD Edwards's Manufacturing Planning system, available to suppliers over the web. Suppliers can respond and High Liner can accept their order. Suppliers can then 'build' a shipping container on the website, with exact specifications of what is in the container and where. This information is used to automatically create and process an order in JD Edwards. "Shipping companies can schedule pick-ups and deliveries," says Burns. "Customs brokers can clear shipments. Our quality control staff can quickly locate and test samples against our strict quality standards as soon as the container arrives, because we know the exact measurements of packing inside the container." "Our manufacturing managers can follow shipments without having to get paperwork from the procurement department and plan around delays and changes. In short, we can track our raw materials continuously online, in real time and make good decisions based on their status." Paul Snow, Vice President, Procurement, adds, "What impressed me about LANSA is that it gave us the flexibility to build a system tailored to our needs and that it tied into our base JD Edwards system so easily. The LANSA web extension allowed us to move away from focusing on the administrative details of buying product from around the world. It reduced the need for paper and phone calls and allowed everyone in the organization and those outside involved in the transaction to work with the same information." "As a result we have more control of the supply chain and can devote more of our time to working with suppliers in the development of new product ideas which will help fuel the Company's growth." "It also allowed us to build a history of information on transactions and quality performance of the suppliers. We have the suppliers' quality evaluation of the product before the container arrives. The system allows us to manage the process better and increase the quality of our products," says Snow. We can manage the process better and increase the quality of our products. Over 80 percent of High Liner's business with grocery retailers uses EDI. The three largest retailers use EDI over the Internet. EDI with the remaining retailers uses a VAN (Value Added Network), to which High Liner also sends transactions over the Internet. Wal*Mart was first retailer to push for EDI-INT AS2 and High Liner achieved this with LANSA Data Secure Direct. "Previously we checked our EDI VAN mailbox a few times a day, but now we receive Wal*Mart's orders directly over the Internet in real-time, giving us more time to prepare the shipping of the order, " says Burns. "EDI is a large part of our communication with suppliers and customers. While we use a third party EDI translator, Gentran, LANSA does all the data manipulation and integration with JD Edwards." "LANSA Data Secure Direct was easy to implement using our own skills. A lot of other EDI products involve setting up Windows servers and complex systems. And the integration with JD Edwards on the iSeries was simple. The low cost and ease of implementation and maintenance gave us the ability to move on to new business projects faster," says Burns. "One of the success factors on our AS2 implementation was the high caliber consulting and service staff we have access to at LANSA. They were helpful, very knowledgeable, dedicated to a successful outcome to our business project, and a definite asset in bridging the technical and business requirement gap. They worked hand in glove with High Liner's technical staff. It's part of the high quality, reliable solution we expect from LANSA." "Thirty percent of our revenue comes from new products. We are now evaluating the business process of developing new products, and we will use LANSA to support this process." High Liner's School Food Service web extension lets schools view available inventory and enter their orders. The order is shipped through JD Edwards's standard order fulfillment and the customer and agents are notified via email of the shipment details. The order can also be tracked via the website. Carolyn M. Gooch, Senior Manager School Food Service, says, "The web extension has established High Liner as a leader in the school food service industry. The site has allowed us to reach districts across the United States 24x7 with a small sales staff. It allows our customers and sales representatives to place orders, access their balance and view outstanding orders at their convenience. Shipping confirmations are generated and transmitted automatically. The system has increased our visibility in the marketplace and has replaced all manual reporting required in government programs." Burns adds, "This web front end for School Food Service leverages our core ERP software, but allows us to present a functional graphical front end to a growing part of the business." "LANSA Data Sync Direct is another LANSA application we are implementing. Again, the business process definition took longer than the software install and use. 1SYNC will be a prime part of our virtual product catalogue and will be the portal for all product info at High Liner." Kelly Nelson, Vice President Corporate Services and Chief Financial Officer, says, "We have been able to develop sophisticated solutions to our business problems with wide spread user recognition of our IT support services." "LANSA has been an important tool in our systems development arsenal for 14 years and is part of the reason we have been able to develop systems in a cost effective manner that fill the needs of our users, the operators of our businesses." "LANSA has made it easier for our development people to create communication flows with both internal and external users. It has helped us turn data into information," says Nelson. "Every year we re-evaluate how we deliver services to the company," adds Burns. "And every year LANSA is the picture." "Whether we need a web, integration, 1SYNC product catalogue or RFID solution, we can depend on LANSA keeping ahead of our needs. Looking to the near future, I know that LANSA is working on an RFID solution and that will probably be our next project." "With LANSA my staff is agile enough to work on just about any business project required. I don't have to wait for the RPG expert, WebSphere expert or the C++ expert. Instead we spend time on getting the business solution in place." "LANSA lets me deliver solutions quickly and cost effectively. It is one of the reasons I have happy, satisfied internal and external customers. LANSA helps us provide business solutions, not just technology solutions." "With LANSA we can concentrate on the business rather than on software development. Our IT group does have technical expertise, but more to the point, they are business process analysts that must be able to recommend change and action it appropriately. LANSA allows us to execute this tactic with a small core group of people." "LANSA has helped us shield the business from technology, but also allowed us to enable the business process with technology," concludes Burns. Every year we re-evaluate how we deliver services to the company. And every year LANSA is the picture. 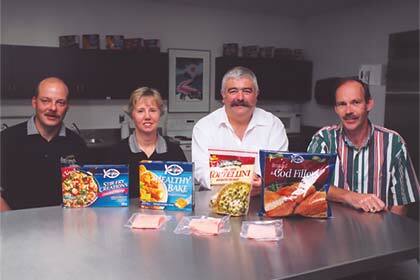 High Liner Foods Incorporated is one of North America's largest processors and marketers of prepared, value-added frozen seafood and frozen pasta. High Liner's branded products are sold throughout the United States, Canada and Mexico under the High Liner, Fisher Boy, Gina Italian Village, Italian Village and Floresta labels and available in most grocery and club stores. The Company is also a major supplier of private label seafood products to North American food retailers and a food service supplier to restaurants and institutions. High Liner is publicly traded company. High Liner uses the latest version of JD Edwards World version A8.1 PTF 2. The Internet procurement system is deployed on an IBM iSeries 270. The main production machine is an IBM iSeries 820.